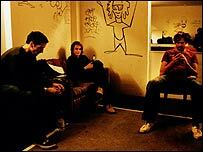 Keane have been described as "Radiohead covering A-Ha"
Influential music critics and broadcasters were asked to come up with their tips for success in the next 12 months for BBC News Online's Sound of 2004 survey. Their responses were compiled into a top 10 of new artists, headed by Keane, Franz Ferdinand and Wiley. Last year's list included 50 Cent, Dizzee Rascal, Sean Paul and The Thrills - who all went on to find success in 2003. What do you think of this year's top 10? Are Keane the best new act on the music scene? Does the list point to a good year for music? Or are there better artists waiting to break through? This list seems like a good thing, if only to advertise some different acts. The best artist on the list is Joss Stone, I think Keane sound pretty plain, but they are better than the latest thing in rock, the shockingly bad Darkness. Surely the people who do this know a thing or two since 50 was voted number 1 last year and look at what he's gone on to be. Yet more proof of why CD sales are down; and the downward slide is set to continue. The RIAA blame pirates for the decline! I make an appeal again to The House of Commons to repeal the "Live Music Act" to give artists in pubs and bars, (like in the 60s) a chance to play, learn, grow and develop. Watch out for a new Marillion album - the sound clips on their web site hint at a stunning album (called Marbles). This band are recording the music we all wished Radiohead had recorded after OK Computer! Franz Ferdinand is the best of the bunch. They're riding the redo-Retro tip so much more attractively than the White Stripes. Keane is boring - Coldplay was all over with this sound of last year. Voice or no voice. Mc Fly is going to do great with the kids though, that mix of surf-popunk is really hot with youngsters. Gemma Fox cannot hold a candle to Ms. Dynamite; good producers and non-political uninspiring lyrics might get her more airplay but no more respect from me. Finally, I was disappointed to hear the covers (Joss and Scissor), I want to hear ORIGINAL music. I applaud any band that wishes to make intelligent and powerful music and I look forward to finding out whether Keane have succeeded in this. But the support and hype for some bands seems out of proportion when you consider the fashion-driven ignorance of the media towards a fantastic band like Marillion. Starsailor, Coldplay and Travis can hardly hold a candle to them when it comes to the emotional strength of their music. And the best British band to come along since? Porcupine Tree! I must reject Ieuan Johns comments about there being "no excuse" for bands not being successful, as long as the consumer supports them. He is surely missing one major point, that without coverage on TV or Radio few bands have any chance to survive, no matter how good they are. Do people honestly think that the likes of Girls Aloud would have had any hits without the massive publicity machine and airplay behind them? Let's face it, there are very few people who will spend their hard end cash on a CD just because a critic says it is good, without hearing something first. Let us just have some sort of even playing field on the radio and tv, without prejudices on what fits and what doesn't fit the current "trends". Keane at no.1 - the world awakens to the greatest band since the Beatles. The list is definitely interesting, without being ground breaking. I think Franz Ferdinand and Razorlight are in with a chance of making a breakthrough in 2004, however this is mainly due to their songs having a traditional format that suits radio channels pre-conceived ideas of what they will play. There are still plenty of good new bands that don't fit the radio channels formula e.g. The Mars Volta and even older bands with good fresh ideas like Marillion, that still don't stand a chance, due to the tunnel vision of programme controllers. It is time for a prime time music show which is brave enough to break free from the current "pop" music rules and show good quality new music without prejudiced constraints being laid down by others. It's all so age dependant. Bands like King Crimson; Yes; ELP, and the individual members of Floyd make by far the better music, but being 50+ they have little image potential. These things simply aren't about music. Graham Powell, Swansea, Wales, U.K.
Keane - another over-hyped band that no-one's really heard. Did lots of big money record companies try and sign them by any chance? Why don't you check out the press and gigs more when you see and read great and original sounding acts like Simple Kid?! You're all so predictable and we're sick of hearing American RnB and over-hyped NME stylee acts. Get off your butts and send someone of our age to check out the real bands. The singer of Keane looks like Aled Jones' uncle, they look so posh and uncool it's unreal. We're bored! I thought 2003 was a great year for music. New sounds, new acts and a lot of different varieties to chose from. I'm happy that rock is slowly becoming more 'accepted', if that's the right word to use, by people of my age (20), even if at times it's a little soft (Busted)! I think people like Beyonce have been blown out of proportion. She's all bootie and not much else. However, with the new artists who popped up last year, I think 2004 will be a year to really define music in this century. However, if more 'Pop Idol' shows are made (as they're meant to) then there's no hope of people sending money on anything decent! Also, I may be 20 and may have read "Vanity Fair" when I was 6, but Ieuan Johns or Port Talbot, there's nothing wrong with S CLUB 8! They're great fun. Real music that's great should do one of two things - make you smile or make you dance. If they can do that, they'll successful - whether they're No.1 or not. Definitely go with Keane. Hope they can achieve something in 2004. Other new bands I like are The Veils, Adom, Amityville so hopefully they get a bit of recognition as well. Actually you already have a pretty exciting music scene over there, you just need to appreciate bands like Puressence, who are around for years now, a bit more! Sorry! Go and listen to Shack or maybe Puressence and you'll all wonder what the fuss is about and realise what you are missing. Don't fall for the hype. Thank you god for Franz Ferdinand! My friend recently went to America and bought me CD by a band called Maroon 5. Apparently they're huge in America and although I don't think their album is amazing it's still good and I can see them doing well if they come over here. I'm just old. All this hip-hop rubbish isn't music. Being so called lyrical and mouthing words does not make music. Thanks for the list. When I am looking for new bands to explore I usually look across the pond first and my own back yard second. To date my fave bands have all orginated in the UK and offer melodies and lyrics that the rubbish south of the border does not. I was impressed by the audio clip of Keane, who sound like they will be up there with Coldplay and Travis in that sort of musical area in saying that all three bands have their own sound. For me soul music is a form of music that I'd never listened to much until I bought Joss Stone's album - she has an amazing voice. I do recall her from Star for a Night which she won but she is doing things her way now and her talent should be highly praised. Soul music has a new fan. I think we should all have a diverse musical ear and I'm happy to have Ms Stones' album alongside Bob Dylan, Hendrx, AC/DC,The Darkness and many many others. When the likes of Will Young, Garath Gates, and that lass who just won pop idol are constantly in the top 10 what chance do "Genuinely Talented" bands have? Bands like Marillion who are creating VERY good sounds are consistantly ignored by the Radio and Television because they are considered "Uncool" - try telling that to the 1000s of people who paid for an album 12 months before it was made! It appears to me that it's not the music that counts anymore, it's if your face fits on the television. The whole music industry needs shaking up. Keane will probably be big in 2004 - a 6th form Radiohead with Vogon poetry who never got a response to the "Guitarist Wanted" ad. I reckon British Sea Power are the best new thing around, if you don't think so you're sad. As an ex-pat working in the music industry, it often baffles me how these hyped up things happen. "A watershed in British music"? I guess sounding like a rehash of Queen or ELO is groundbreaking to some. How about giving a listen to some of the music that doesn't involve just trying to create a new sound off the backs of artists people are too young to have heard? Or is that just too sensible? But don't think the UK is alone in getting all excited over nothing. The White Stripes are huge over here whilst sounding like a bad MC5 cover band, but less than 3 years ago I couldn't find anyone to take their promos off me for free...go figure. When are British bands going to stop aping the sad declining urban music of America!? Come on, bands like Franz Ferdinand are making people realise that the real stuff in pop is here. Some others old and new below: Ladytron, the Futureheads, and so much more. Franz Ferdinand are clearly the best band to come from anywhere in the last 12 months. The sheer quality of their eponymous album that I've got on promo is outstanding - not a bad tune in sight and some of the most infectious hooks you will ever hear. They will be massive (at least with those who matter musically) and they deserve it, good one lads! A couple of decent bands on the list, but there's a band called Kid Symphony that are gonna blow people away. They play big anthemic rock tunes, with just a hint of Queen. Kinda like a good version of the Darkness. Watch this space, cos the Kids are coming to get ya! Aaron, Urban music gets more than enough exposure and I'd hardly say it's what the people on the streets are listening to. As for artists like Lemar and Dizzy getting no exposure, where have you been the last 12 months? Personally I'm sick of urban music, Sean Paul sounds like that Ali G single out a few years ago... an utter joke. Keane fully justify their top placing. A wonderful voice which makes a pleasant change these days. Franz Ferdinand & Razorlight are impressive as well. When will people stop pushing urban music down our throats. It's passe and becoming a parody of its self. I am sick of hearing the same old lyrics. I'm better, richer, stronger than you, I can rap better than you or I've got more women than you. It's time the rap acts grew up. I was recently asked by some friends at a meal to guess what bands I thought would be big next year, and the two I mentioned turn out to be numbers one and two on the list. Guess I must have been paying attention! Liverpool has consistently produced great bands over the years and the list produced does not reflect the current vibrant Liverpool scene. Following in the footsteps of The Coral are, amongst others, The Bandits, The Basement, The Zutons and The Stands. The latter two release albums shortly and should go on to greater things in 2004. Yet again a complete list of 'hyped' bands with little talent or substance. There are already lots of fantastic bands out there yet to receive critical acclaim, simply as they do not fit the mould. Bands like Puressence and I Am Kloot for example. When people like Victoria Beckham, Will Young, Shane Richie and Atomic Kitten are all in the Top10 there's something gone horribly wrong with the music industry. Is that just my opinion? I don't think so! To be honest if you have lived in a box over the last year it's plain to see that urban music is slowing becoming the new pop. So why doesn't the media support artist enough like Dizzy, he's making just as many waves as Wiley is underground shifting such figures as 50,000 copies on white labels - does Dizzy appear on CD:UK,TOTP? No. Even Lemar who has finally broken the door down still seems to be struggling with exposure, Media guys and girls support real music that the streets want - if they can't see/hear it they can't buy! I recently saw Razorlight supporting Suede in Bristol and didn't rate them at all. It looks like these influentual music critics don't get out much. Look out for the Bristol band Chikinki this year ! There are not really that many quality bands around in my long experiences in live venues around England ! However, Sheffield has a growing number of candidates for breakthrough status this year. Best of the Best are SKYDIVA, The Moon, Milburn and Judan Suki - make evry effort to see them during this year. As good as some of these new bands may be, I still find it hugely frustrating that so many established bands are being ignored, simply because their faces don't fit. A prime example is Marillion, who are vilified by the press and radio because of their image 15-20 years ago, yet are actually making music every bit as good (and as up-to-date) as anyone around today. And they're doing it all off their own bats, without a shred of record company support. More power to 'em! I'm really surprised that Delays are not on the list, their latest single due for relase on Jan 19th has been on most of the independent radio stations playlists for the last month and have been predicted by many to become really big in 2004 but predictably once again have been mostly ignored by BBC music with the exception of Mark and Lard who have championed Delays since the release of their 1st single early last year. Even so Delays will succeed this year even without any help from BBC music. I've seen Keane live and their position at the top of the pile is definitely justified. Seeing them live sends shivers down the spine. They will definitely have a majestic, soaringly beautiful albumn if their live show is anything to go by. The problem with these kinds of polls is that it descends into a "I know more about obscure music than you do" competition. What people forget is that the music industry is controlled my people like Simon Cowell and Simon Fuller, who don't care if artists have talent or not. They are just in it to make money. The only bands that will become huge are those with commercial appeal. Musical talent is secondary, otherwise we wouldn't see acts like Busted, Blazin' Squad and Atomic Kitten dominating the top 10. In terms of bands that 'should' become big, Keane and Franz Ferdinand are both good bands, but I was surprised not to see Hope of the States in there. Also, the Snow Patrol return with their second album which should be a good one. Bluejay? Rubbish. It's an interesting idea to have a band without guitars but with a piano instead. Why stop there though. Let's have a band with a flute, violin and drummer but no singer. I'd love to hear that. It usually takes until the second or third album before any new artist realises their full potential, after they have moved on from their seminal material. Accordingly, and after hearing excerpts from a couple of tracks, I believe that one of the landmark albums of 2004 will be the new Kelis release. Hmm, will have to check out Keane...but Franz Ferdinand are an amazing band, surprisingly original in a time when originality seems hard to come by. I want to see Ed Harcourt make it big in 2004. This is a young man with a raw talent for writing and performing that deserves more recognition. I don't agree with this list. It's just a rubbish idea. Whether or not Keane are any good, "opinion makers" will pick people they intend to play endlessly on the radio. They could pick me farting the national anthem and if they played it 19 times a day on Radio 1 it would be successful. Talent cannot find its own way in this day and age... it as to be sponsored by people pretending to like it... like Jo Whiley, who is too old to pretend to be enthused by what teenagers may or may not like. Wow, I managed not to hear any Keane yet and listened to the clip. The singer voice reminds me of Jeff Buckley. I don't think I can pay a greater compliment than that! Saw Keane on Later With Jools Holland a few months back. They were very dull and uninspiring. Combine the worst aspects of Travis, Coldplay and Starsailor and you have Keane. They'll shift units because they will appeal, but we need something a little more interesting...such as Kasabian! I think the fascinating thing is that you've got a whole range of music, whether new bands like Keane, urban musicians like Dizzy, older but constantly innovative bands such as Marillion, folkies, jazzies and whatever elsies and as Kate from Dublin implies, when you've got a music industry that is only interested in short term acts such as the ones she mentions, none of them will get a look in. Look at Top of the Pops - wall to wall interchangable pop aimed at pre-teens. No one's saying get rid of teeny-pop, but for God's sake, music is capable of so much more if only programmers and record companies were bright enough to stop treating listeners as stupid and as conservative as they seem to think we are. There's room for new bands and older bands as long as they meet a simple criteria: They're good. I think Keane will make it. They've got the hype behind them, already radio 1 are tipping them for world appeal. It's a shame Hope of the States aren't on the list, maybe they'll be big in 2004?! Forget about "radiohead covering a-ha". A-ha are the real deal - achingly beautiful songs, popular the world over, and with enough talent and maturity to last out the eighties and nineties. Franz Ferdinand sound the best of the bunch, maybe Keane can nudge Coldplay aside although the return of ballad rock isn't the best news, saying that, it's better than that awful kid Casio ear bleeding cover of Comfortably Numb. Problem with the list is that most are remakes of this year's big bland bands or utter crap. I'd like to have seen another Domino artist, "Adem" one of the guys from Fridge, on the list instead of Franz Ferdinand. Heard a track on BBC radio played buy Fourtet sounds fantastic! the single released by Rough trade was superb, and live he's amazing. Why all the moaning about talented bands not getting a chance ? If YOU, THE CONSUMER, support them then they will do well enough. They don't have to be No.1 or on CD:UK to justify their talent but that is the common perception. It used to be hard to find music by obscure bands unless you were lucky enough to have a great record shop nearby. But in todays world where you can buy almost any CD released through the Internet. If you like it, find a way to buy it, find out where and when the gigs are and go see them. You can decide who is successful in the music industry, so what if S Club 8 are No.1, I don't care so long as they bands I really appreciate are still going because of OUR support. There are no longer any excuse for those people who moan about the state of the industry and then do nothing to support talented bands (and lets face it we all know someone like that). If everyone of you who complain about teen-pop dominating the charts actually went out and bought an album by Keane, Marillion, or whoever then it would change things.